People just don’t make ham salad like they used to. At one time, you’d see it on just about any occasional buffet table, be it wedding, anniversary or funeral, but nowadays it’s all pimento cheese and hummus. Maybe it’s that same room-temperature mayonnaise consideration that keep tuna or chicken salad at bay, or simply a drift away from meat. Still and all, ham salad is a beautiful option when you have holiday ham left over. It’s a good nosh whenever. Three ingredients are essential: a binding agent—it doesn’t have to be mayo; cream cheese will do, too—finely diced or pureed lean ham—you can throw a rind or two in the processor for succulence—and pickle, usually pickle relish, but that’s not engraved in stone. 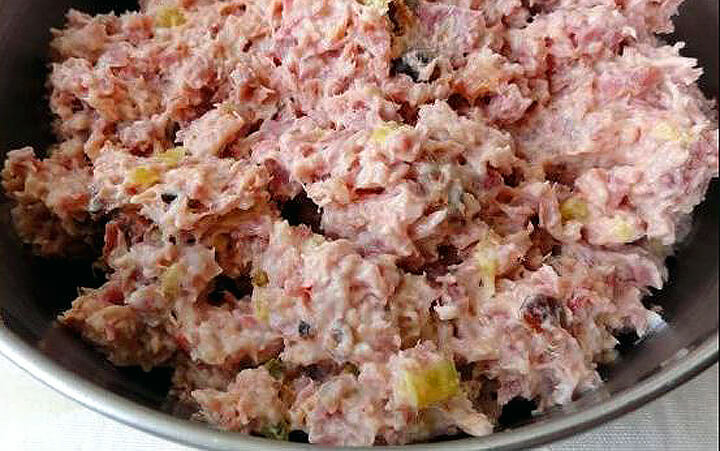 I like a fine consistency with horseradish, mustard and a little grated onion, but “Joy” says of ham salad, “Let this be a matter of inspiration”. So it should be. There used to be… may still be… a restaurant on Hwy 49 just past Hattiesburg, near the gate to Camp Shelby called Louisiana Sisters. They had the best ham salad ever.